Evertz is a global leader in the broadcast technology industry positioned to disproportionately benefit from the upgrade cycle to cloud-based 4K / HDR media delivery. The company has demonstrated exceptional internal returns and smart capital allocation practices over a long period of time, is trading at an undemanding valuation and yields 4.5%. We have a high probability 12-month expected total return for Evertz Technologies in excess of 30% with the potential for additional upside from transaction-related catalysts. Evertz makes technology that you use everyday. As a manufacturer of broadcast hardware and software delivery solutions to both home and mobile you benefit from Evertz technology every time you access live or on-demand content from your TV or mobile device. When you watch instant replay of an 80-foot putt hitting the cup, a Tom Brady QB sneak across the goal line, or a buzzer-beater from half court you are benefitting from Evertz’ multi-faceted technology platform. When you are watching Discovery Channel and an advertisement promoting Shark Week pops up it is being controlled and displayed using Evertz Technology from the cloud. Evertz products were a staple in NBC production operations centers for the Pyongchang Olympics, helping to capture over 2,400 hours of 4K content and deliver it to the world. Evertz is a global leader in its industry and will be integral to the ongoing advancement of high-definition broadcasting technology, yet few investors have ever heard its name. The full Evertz product lineup includes software, hardware equipment and virtualized “cloud based” solutions. Primary clients include independent content platforms (eg. Amazon and Netflix), network broadcasters (eg. NBC, Turner), specialty content channels (eg. Discovery) and cable television service providers generally. The addressable market represents an annual spend of approximately $40 billion. While Evertz is not the only operator in this market they are the premier product in each of the spaces they compete in. Moreover, Evertz is viewed as an innovator by their installed client base which is a beneficial competitive advantage in an industry that is always looking ahead to the next product suite or upgrade. Evertz presents one of the most compelling opportunities in our investment universe. This is an underfollowed company with a great internal returns and capital allocation practices that is trading at an undemanding valuation and paying a 4.5% yield. Evertz checks the boxes on a majority of our key investment criteria: great products, specialized market, consistent revenue trends, excellent cash flows, exceptional management team, and very well positioned for future growth. We have a high probability 12-month expected total return for Evertz Technologies of 31% comprised of a $21.50 target price and a 4.5% dividend. Additionally we see moderate probability of a transaction-related catalyst leading to +50% returns over this timeframe. We believe that Evertz is at an inflection point and should be bought in both growth and income-oriented portfolios alike. While the stock has been range bound for several years its attractive dividend policy has rewarded shareholders with a steady compound total return annualized at 7.7% since January 2015 (14.1% since January 2011). Limited liquidity may prevent larger portfolios from taking a position at the current time, but this provides nimble investors an opportunity to get in ahead of accelerating revenue growth. We see recent product upgrades, including industry leading virtualization and IP-based products, driving the cadence of new large order awards over the next 12-18 months. We anticipate strong pipeline/backlog growth as the industry moves towards virtualized and IP based technology. Upcoming large industry conferences should act as the springboard to this new sales activity. The revenue model for certain segments of broadcast technology has become much more recurring in nature. We see a more stable revenue profile supporting higher multiples. We estimate that currently 15% of Evertz revenue is recurring and see this figure doubling in the coming years. In the fast-moving technology space innovators will continue to steal market share. With an industry leading R&D spend, Evertz is positioned to maintain its status as a leading-edge provider. The biennial broadcast cycle of marquee global events provides opportunity for Evertz to showcase their capabilities this year. At 7.5% of market cap ($98 million) cash is starting to build up again. We see high probability of a special dividend or cash funded transaction in relatively near future. Canadian technology companies are currently in the crosshairs of private equity and cash rich US technology companies as evidenced by the large number of recent takeover bids. 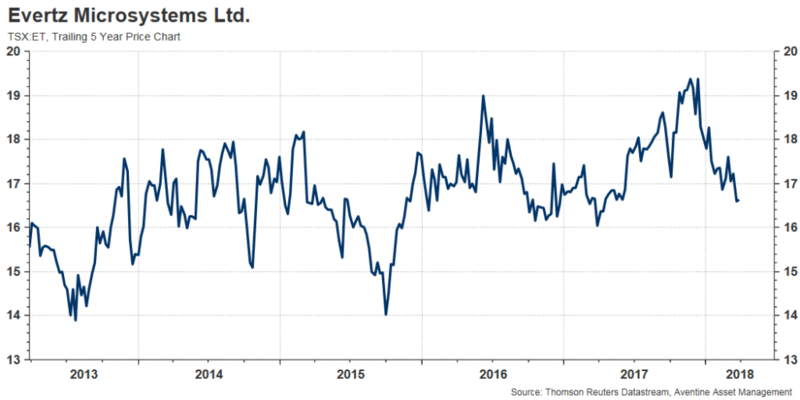 With 80% of sales outside of Canada the depreciating Canadian dollar is providing a boost to local currency cash flows. I. Free Cash FlowManagement has fostered a culture of excellence with a focus on profitability and this has translated into strong cash flow generation on an annual basis. The company understands the need to make growth investments on an organically and self-sustaining basis. We calculate current free cash flow yield at 4.5% which we find very attractive versus peers. Prudent management of the cash cycle within the business allowed Evertz to avoid issuing any new equity since their IPO in 2006. II. Balance SheetEvertz is essentially debt-free with a net $1.28 per share in cash on the balance sheet. This has been a staple of Evertz’ capital structure management – the company has never been in a net-debt position since its IPO. Periodic special dividends have resulted in large drops in reported cash per share but we assign virtually no balance sheet risk to this company. Notwithstanding the potential for accretive corporate actions to be a net use of corporate cash, we expect Evertz to continue paying special dividends when the cash balances gets high enough that it starts to drag on internal return metrics. III. Research & DevelopmentEvertz’ investments in research and development activities has consistently grown in both absolute and relative terms over the past decade and now outpaces that of its closest competitors on a percentage of sales basis. 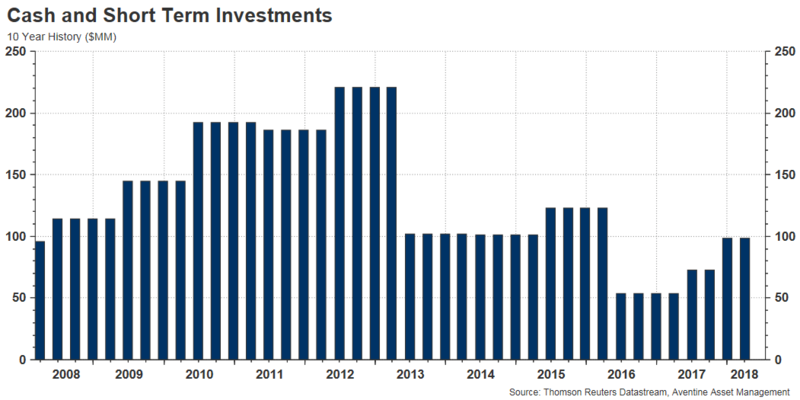 These investments are being made as the industry enters a new technology upgrade cycle and demand for superior next generation products is growing sharply. Client feedback we have heard on new product features has been very positive and the company has recently been the recipient of a several industry awards for innovation. We do expect to see R&D as a percentage of revenue fall in calendar 2018, however this will be the result of sales growth beginning to outpace spending. IV. Sales & PipelineSales at Evertz have historically tended to be lumpy, a reflection of the legacy revenue model which has been dependent on the reinvestment cycle. As the recurring component of total revenue grows this will continue to normalize figures around the longer-term trend. The broadcast industry underwent a significant upgrade cycle to add HDTV capabilities in the 2008 – 2010 period. This was a big tailwind for Evertz and drove revenues higher by 50% over that time frame. Amazon AWS has emerged as a key marketing partner for Evertz over the past year. At the AWS RE:Invent Conference (the leading global cloud computing conference) in November 2017 Evertz led a session in the media and entertainment program on the cloud based application solutions available to modern media companies. The opportunity conferred through this preferred provider status with AWS has yet to translate into a meaningful sales lift, but we are optimistic that validation from AWS along with the upcoming conference will continue to elevate the brand and image of the Evertz product lineup. The chart below shows that we are already seeing an acceleration in sales growth as the year-over-year revenue trend presently stands at 11% on trailing 4-quarter basis. The backlog has also been quite strong for several quarters although we saw a dip in the most recent reporting period. Over the past decade investors have been well served buying the stock when the backlog growth over the last 4 quarters goes negative. The broadcast infrastructure business is somewhat unique in that there is a two-year circuit of marquee global broadcasting events. The years ending in even numbers tends to be where the action is, and the 2018 calendar sees the PyeongChang Winter Olympics in February, the FIFA World Cup in Russia through June and July, and the US mid-term elections in the October-November period. For comparative purposes, 2016 saw the UEFA Euro Cup, the Rio Summer Olympics and the Trump-Clinton US presidential election. Evertz has already received positive PR for their part in NBC’s successful Olympics coverage in the US as well as Eurosport’s coverage across multiple platforms and languages to the EU market and will be looking to build on this momentum through the remainder of the year. Evertz products represent a critical component for media companies looking to promote and expand the reach of live sports and other high profile broadcast events in 4k definition, and Evertz has been successful at securing long term contracts with these customers. Evertz is slated to be the incumbent provider for IP/Virtualization solutions to both NBC (through 2032) and Eurosport (through at least 2024) for the Olympics which should provide a highly visible platform for the company to showcase both existing and new tech. 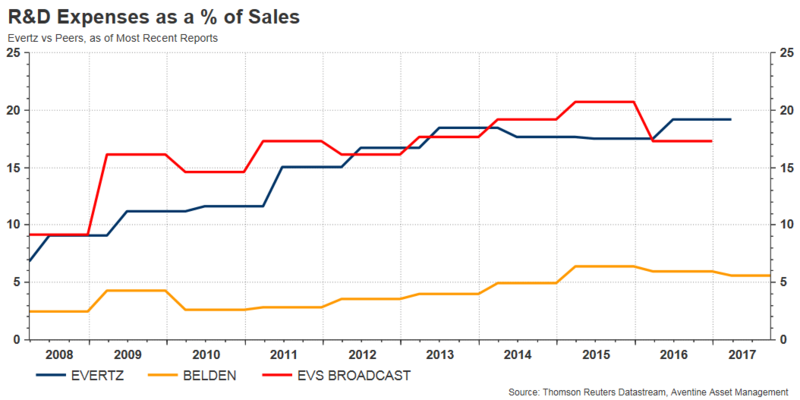 EVS Broadcast (EVSB – Belgium) – 1 yr. share price has declined 20% from €35 to €27 mainly due to revenue and margin compression. Forecasts are healthier on the top line but come with higher operating expenses as the company supports more R&D and new product initiatives. We believe Evertz is a step ahead of EVS in instant replay technology and video server products. EVS is trading at 7.5x EBTIDA. Market cap is €360 million. Harmonic (HLIT – USA) – 1 yr. share price has declined 35% from US$6 to US$3.75 mainly due to a persistent lack of profitability and a growing debt load. Their backlog is healthy and at record levels ($200mm), so calendar 2018 may bring a turnaround if they can execute well. Evertz and Harmonic turn roughly the same revenue, but Evertz boasts a much higher margin profile, a solid dividend yield, no debt, and a much cleaner share structure. HLIT is trading at 8.6x EBITDA. Market cap is US$325 million. Belden Inc. (BDC – USA) – 1 yr. share price increase of 10% from $70 to $76 (USD), despite a drastic 30% pullback from the high 80’s during the January peak. Belden struggles with organic sales growth and is more of an acquisition/conglomeration structure, so their focus is less specialized. They have done well to maintain their market share, but Evertz continues to field better products. BDC is trading at 8x EBTIDA. Market cap is US$2.7 billion. Imagine Communications (Private – USA) – Despite spending a lot on marketing from what we understand they are struggling to keep up with the newest technologies and are losing market share as a result. Management has a substantial equity stake in the business, are passionate about the technology and have consistently shown that they will run the business in a shareholder friendly way. In technology, you won’t survive for long unless you can see future trends as they emerge. During our research we have heard Romolo Magarelli and Douglas Debruin referenced as “visionaries” a number of times. This team is not managing from the boardroom – they are hands-on with customers and involved in technology development. When we asked about an exit, the management team told us they “are having to much fun” to sell the company. Its not often we hear management teams talk about their business this way and its certainly refreshing to hear. Each of these individuals owns 31.6% of the company and neither have sold a single share since the IPO. The team of EVPs rounding out senior leadership are each very capable and in possession of complementary skills. Brian Campbell, an ex-investment banker in the technology sector is the head of Business Development and could be a driving force behind deal making if they decide to take that route. Brian currently owns 2.1 million shares of Evertz or 2.75% of the company, up from 1.2 million when he joined. Rakesh Patel is the CTO of the business, responsible for the research of new technology, product development and technical leadership through the client integration process. Rakesh currently owns 1.2 million shares of Evertz or 1.6% of the company which is down from 1.3 million shares a couple of years ago. He has played an integral role on the company’s senior leadership team since 1998. New Business Wins Accelerate: Evertz is able to capture 3-4 new customer relationships representing annual revenues in the $10-$25 million range each, while also delivering on planned expansion in the existing product backlog. Under our base case scenario, revenue growth gets a boost to double digits and EBITDA expands from $107 million (current estimate) to $125 million given higher margins. The company’s EBITDA multiple grows from 10x to 12x given the higher absolute level of sales as well as the recurring revenue nature of new deals. At 12x this gives an enterprise value of $1.5 billion which corresponds approximately to a target price of $21.50 or a 27% gain from current levels. Low marketing budget relative to peers. A large acquirer with extensive platform marketing capabilities could drive sales growth without much of an incremental business spend. Management salaries and the R&D spend are high. Reducing either of these would be relatively simple and improve cash on cash returns from an already solid level. Several great Canadian technology companies have already been acquired this year (RDM Corp, Halogen, Sandvine, DH Corp, Avigilon, Pacific Insight, to name a few) and we think that tech bankers in Canada are busy pitching management teams across the sector on potential combinations. Evertz is a ideal investment for our Canadian Equity strategy: great products, great cash flow, great management team, history of special dividends and consistent revenue growth. Looking ahead we think that the company is very well set up for continued growth over the next 1-2 years also. We believe in this management team as long term stewards of investor capital and project that the sales force will be able to 1) build on recent wins with major broadcasters, and 2) begin to reap big rewards from working as a preferred vendor into the Amazon AWS ecosystem. We think that if Evertz continues to execute well and deliver innovative customer solutions it can dominate the migration of media to software-defined video networking, IP and virtualization. If they can capture 3-4 large customer wins over the next 12 months and maintain the existing base we will see the company take a big step forward in terms of investor awareness and interest. We think this company sees its stock price push to new all time highs and return >30% to shareholders on a total return basis from today’s price. This is a solid base case. If we are wrong in terms of timing or magnitude of new contract wins, we see downside yield support in the high $15 dollar range with a total return of perhaps 0-10% based on current prices ($16.70). Aventine Asset Management is partner-owned investment management firm with a focus on capital preservation and long-term growth. Based in Toronto, Ontario we are a concentrated, long-biased value investor with an emphasis on opportunities in the mid-cap market segment. Aventine presently manages four strategies – Aventine Canadian Equity, Aventine US Equity, Aventine Stable Income, and Aventine Total Wealth.